Write your own caption: Disembodied Slippers? 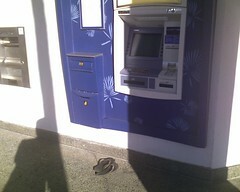 Spied these homeless slippers in front of the ATM at the HMSA building. I could probably think of any number of funny captions, but what do you think? You are currently browsing the Freshly Squeezed weblog archives for October, 2009.